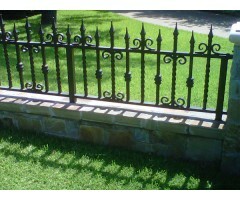 The style of this fence dates back to the mid 1800s and is described as a Scalloped Picket. It is very stately and elegant with it's scrolls, spear point finials, the twisted pickets framed with a c-scrolls and every other picket adorned with a collar to add to the design element. 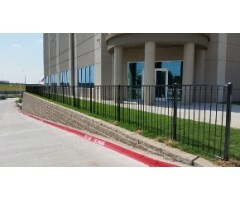 This particular fence was set on a curb wall to even give it more integrity. .. 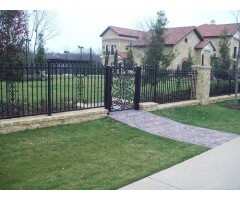 This custom iron fence created a high style boundary for this estate. Adding not only value, but elegance, and security. 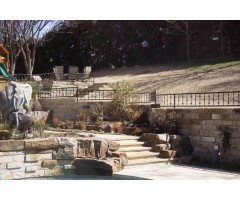 Designed with a cast iron centerpiece on each panel, and beautiful finials, with two rows of sizable collars on each individual picket, all set on a stone curb wall to create a big impression. 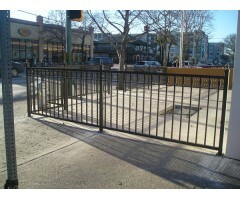 The custom gate is featured under EX-008 in the "Gates" category. .. 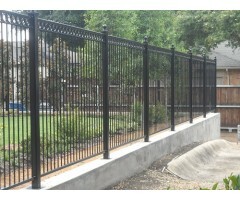 This fence was designed with an O-ring upper border under a smooth top rail. Each vertical post was topped with a ball top, and the pickets were framed on a bottom rail. .. 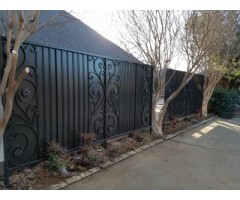 This custom wrought iron fence was produced with added interest collars, fleur de lis finials, and post balls, creating a beautiful boundary to the entrance of the home. .. 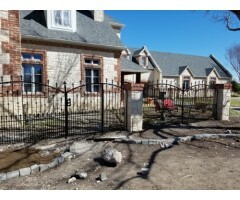 This fence created a beautiful boundary with its gold picket finials, and the curved top on the gate. .. The top scrolled border adds definition and interest, and the arch on the gate provides a beautiful entry point. .. Simple clean-line design used in commercial application in this photo. 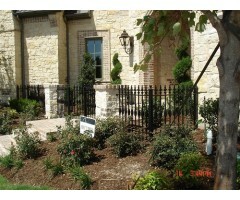 ..
Border of elegant iron scrollwork on the top of this privacy fence offers an element of "class". .. 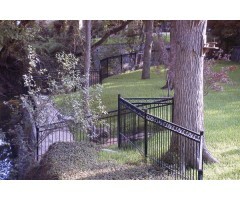 Alternating larger scale knuckles create a beautiful effect on this border fence. .. This unique fence was made to keep small dogs in one area. ..